Share the post "Paul Howard receives an honorary fellowship from Dramsoc"
Paul Howard, author, journalist and playwright was presented with an honorary fellowship by UCD’s Drama Society in the society’s theatre on Tuesday 29th January. Howard, who is best known for creating the now iconic satirical character Ross O’Carroll-Kelly, managed to keep an intimate crowd in visceral stitches of laughter in this versatile appearance, which included an interview, a reading of an O’Carroll Kelly column from The Irish Times and questions from the audience. Leading up to the presentation of the honorary fellowship award, which he gratefully assured the audience that he will put on his mantle, Howard spent over an hour and ten minutes taking the audience on a journey through the somewhat accidental arc of his career. From formative moments of childhood adversity, to outlandish interactions at rugby matches he had witnessed during his budding years as a sports reporter, Howard seamlessly wove together an explanatory tapestry by which his style of comedic writing, and the Ross O’Carroll-Kelly character itself came to be. Howard’s extensive works include eighteen novels following the conquests of the Blackrock boy Ross O’Carroll-Kelly, which traces the characters gradual humanisation from an outlandishly out-of-touch comedic tool of social commentary, to an unlikely (and often unlikeable) hero who the reader cannot help but root for. Like many South Dublin UCD Commerce students, Ross faces a constant battle to make peace with the fact that he will never fulfil his destiny of being the next Brian O’Driscoll. When speaking regarding his comedic satirical style, Howard expressed that he felt the value placed on the ability to make people laugh is underrated, while stressing the act of comedy as a noble ambition, one which he feels is consistently undervalued within the world of the arts. Comedic plays were used as an example of how undervalued humour remains within the arts, as he claimed that, despite their quality, they never win the most coveted awards. However, this did not stop Howard from writing four successful plays such as Breaking Dad in 2014 and Copper Face Jacks: The Musical last summer. Howard also repeatedly mentioned how much it meant to him seeing his productions being performed by the UCD Dramsoc, and the enjoyment and laughter which their interpretations of his work brought him. Howard told of how his Irish parents decided to move back to Ireland when he was eight on account of Margaret Thatcher winning the election. He recalls the feeling of being up-rooted due to this move, as when his father announced this mode of action upon Thatcher’s victory, he thought he was joking. Upon arrival in his parent’s homeland, a place where everybody seemed to be leaving, he and his family made a home for themselves in a council estate in Ballybrack. Howard immediately faced trouble in school due to his strong English accent. He revealed that during the time of the hunger strikes of the 70s, fights in school were a regular occurrence. Each time he heard of another hunger striker dying, he and his brother begrudgingly braced themselves for the throwing of punches that were sure to meet him the following day at the school gates. Howard almost relished in the dark humour of it all, as he fondly recalls how he discovered his love for making people laugh in school, when he would stand in front of the class and read out an outlandish essay he wrote while the rest of the class learned Irish. Over all, Paul Howard described himself as a spoofer, as he reveals that none of the life changing breakthroughs that he has enjoyed have been part of any plan, as the only thing he ever really wanted to be was a sports reporter. And the Ross O’Carroll-Kelly thing? Well, that kind of just took off really. The phenomena which encapsulates the culture of South Dublin prosperity, and provided an invaluable record of social history for Ireland’s Celtic Tiger and economic down turn has gone far beyond its beginnings as a weekly column in the Sunday Tribune. 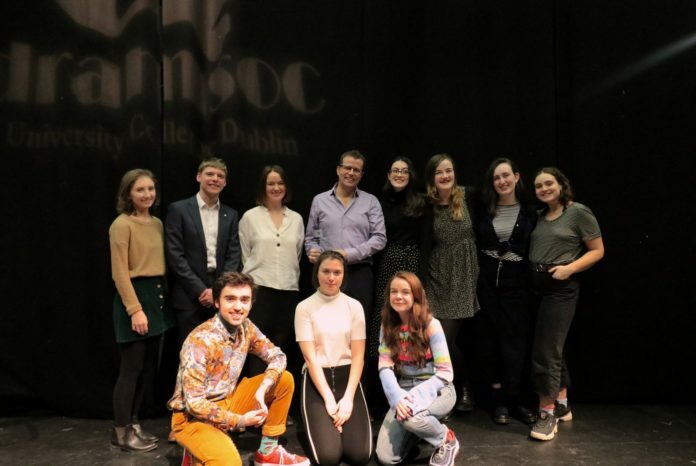 Paul Howard was given an honorary fellowship by the UCD Dramsoc for gifting us with something between a cult classic and a household name, a facet with which we may analyse the society we live in yet provides us with a means of escapism through laughable absurdity all at once.